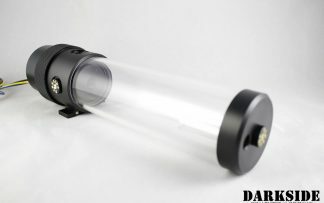 All reservoirs of the aqualis series are equipped with a borosilicate glass tube. In contrast to acrylic glass, which is often used for tube reservoirs, borosilicate glass is extremele hard and scratch-resistant, features superb thermal and chemical resistance and a very low thermal expansion. 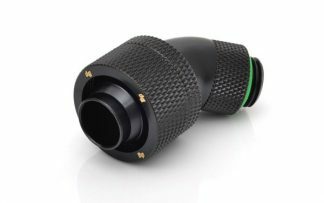 The glass tube has an outer diameter of 75 mm and a wall thickness of 5 mm. 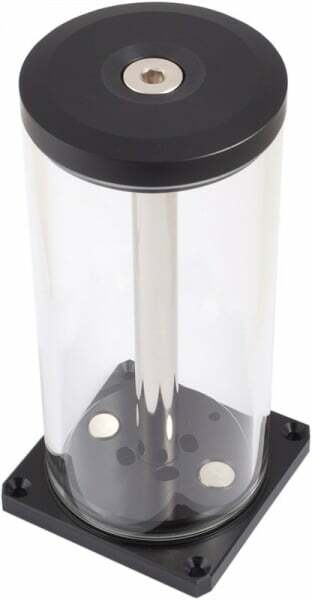 Base and top of the aqualis reservoirs are made from Delrin and connected by a nickel plated brass tube. 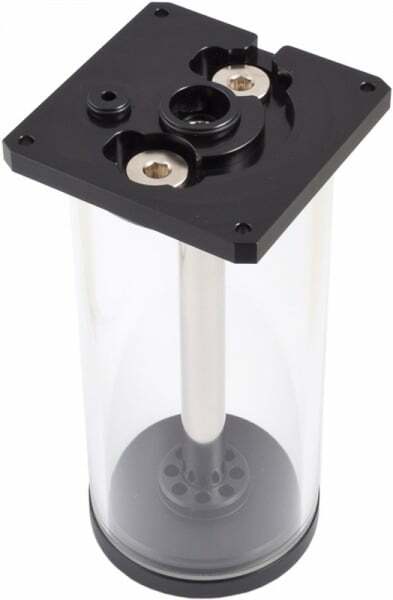 The aqualis base for pump adapters variants are equipped with sockets at the base of the reservoir and can only be used in combination with a compatible Aqua Computer pump adapter! Special features art. no. 34044, 34045 and 34051: Up to two optional illumination modules (for example art. no. 34920, not included in delivery) can be installed into two G1/4 threads in the base part. Special features art. no. 34046, 34047 and 34052: As a optical highlight, a fountain effect can be realized. If the return line is connected to the connector in the socket of the reservoir, the water flows through the brass tube to the top of the reservoir, where it is ejected through eight nozzles. In combination with illumination, this is a real eye catcher effect. A thin acrylic plate near to the bottom of the reservoir reduces air ingestion to a minimum. These reservoirs additionally feature an acrylic window in the base part and up to six LEDs (5 mm size, for example art, no. 95025, not included in delivery) can be installed into the base part. All 450 ml variants are also available with a nano coating that will cause water to roll off the inner surface of the borosilicate glass tube. Please note: This reservoir must be used in combination with a compatible Aqua Computer pump adapter, please order separately.